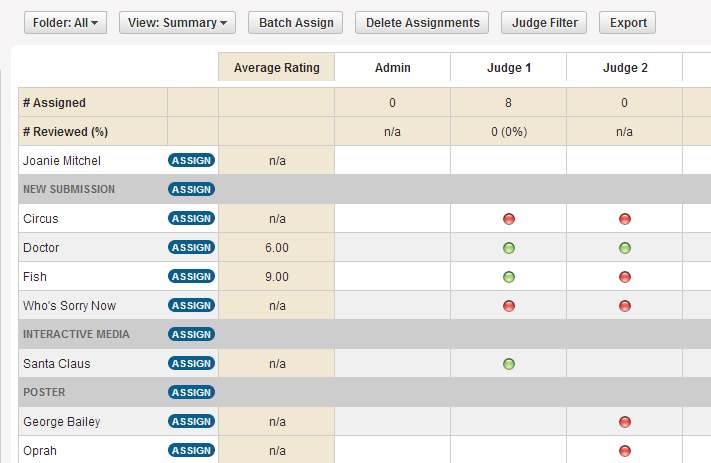 The Assignment grid is used to assign responsibility for review of entries to defined judges or reviewers. Assignments can be made by entries, by folder or by batch assignment. This feature allows you to “assign” reviewers to different forms. This is critical to support private review portals so that judges see only those entries that they are being asked to review. Assignments are typically used to assign certain forms to someone when they are going to log in to a review portal. Assignments control the “assignment” of entries to reviewers. Comparatively, Privileges are used to limit the information that members can see when they log in to the backend of WizeHive. In the Assignment grid, you can see the number of assignments each reviewer has and the amount and percentage of reviews they have completed. Assign a particular judge to one or more folders. As forms are added to that folder, the judge will automatically be assigned to them. Assign a group of judges to one or more entries or one or more folders. Batch auto assign. For example: "We have 100 judges and 1000 applications and we want 10 records randomly assigned to each judge." Please note that you cannot use this feature until you are ready to assign all such record submissions. NOTE: After assignments are made, it is important to remember to check the “assignment filter” in the portal. If the assignment filter is turned ON, then reviewers see only those records assigned to them via the Assignments tab. If the assignment filter is turned OFF, then reviewers see all records in the tab/folder being displayed. If you are going to be assigning applications or folders by group, you also need to make sure that the group(s) have been created. Under the Assignments tab, click Folder and select the folder that you want to assign or that contains the application that you want to assign. You also have the option to select All, which will show all folders. You also have the option to change the view. Selecting View: Summary shows a grid similar to the screenshot above. If a reviewer is assigned to a given entry, there will be a dot that appears in the corresponding cell. If the review is complete the dot is green, if it is incomplete the dot is red. In this view you can assign by folder or entry. Next to each folder is an Assign button, clicking on that will give you a list of check boxes correlated to each reviewer. Checking a checkbox will assign the given reviewer to all entries in the folder. Note: if you want to assign a folder but there are no applications in that folder, you will need to add a fake entry into that folder and then refresh the Assignments screen to make the assignment. To assign by entry, click on the assign button next to the entry name you would like to have assigned. The system automatically updates when you check the box - you don't have to click Save anywhere. 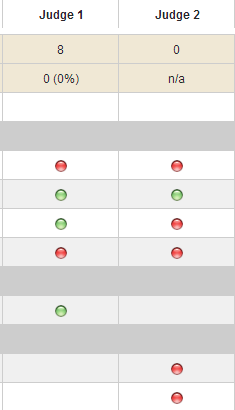 You can check the status of a review by observing the red and green buttons on the assignments grid. While drafts cannot be checked, you can see if an assignment is Complete, In Progress, or Incomplete ( Red = Incomplete, Yellow = In Progress, Green = Complete). The Judge Filter can be used to change the judges that come into view when you are making you assignments. This filter will remain until you log out of the Select system and log back in. All judges are shown by default.